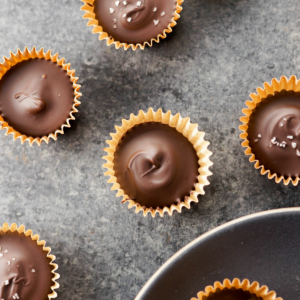 An easy recipe to make vegan peanut butter cups at home. Line a mini muffin pan with the 16 paper liners and set it aside. Melt half of the dark chocolate (about 3/4 cup dark chocolate chips) over a double boiler. I simply arrange an heat-safe bowl over my 2-quart sauce pan that has been filled with about an inch of water, and then bring that to a boil. Once the chocolate is melted, use a teaspoon to scoop the chocolate into the bottom of each mini muffin liner, then set the pan aside again. To prepare the peanut butter filling, stir together all of the ingredients in a medium bowl, until the mixture is thick. Use a teaspoon to measure out the filling, then roll it between your hands to form a ball. I like to gently press each ball between my fingers so that the top and bottom are slightly flattened, that way the peanut butter cups won't look too round. Allow the cups to cool at room temperature, or put them in the fridge to speed up the process. Because this recipe calls for natural peanut butter, which is normally stored in the fridge, I'd recommend storing these in the fridge if you don't plan on serving them all within two days. They should keep for a month or more when stored in an airtight container in the fridge-- unless you eat them all before then!